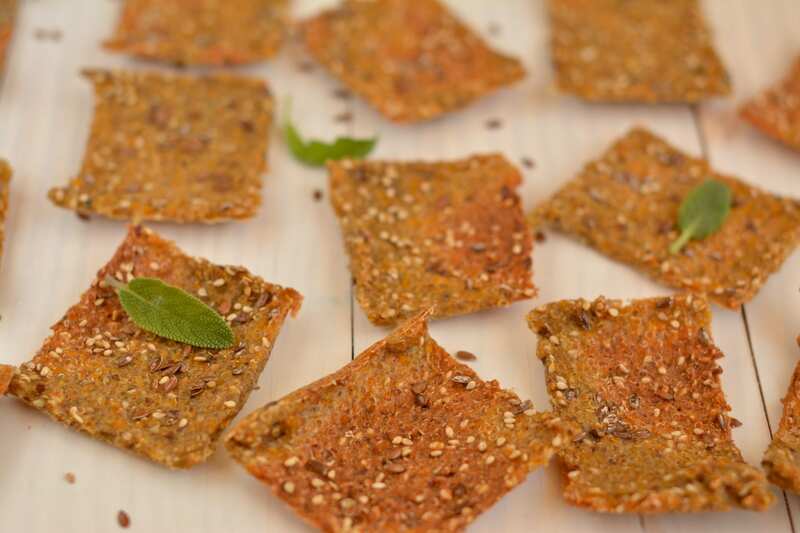 After making buckwheat crackers with sun dried tomatoes, olives, smoked paprika and sunflower seeds last week, I was eager to try a plainer combination with fewer ingredients. However, I wanted to use two grains and my choice came down to quinoa in addition to buckwheat, as it’s possible to process it into batter after soaking. 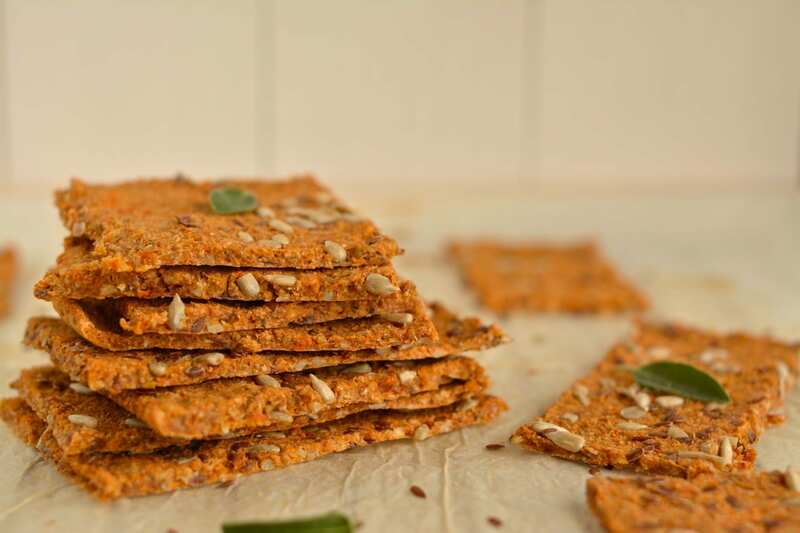 Also, my goal was to make a leaner version of crackers using less seeds – only 1 tablespoon of sesame seeds and 1 tablespoon of ground flax seeds. So, despite being whole foods, eating too much of nuts and seeds can affect your weight and health. And yet, it is better to use nuts and seeds in recipes instead of oils! That’s because 100% of calories come from fat in case of all extracted oils. A person with no weight problems can eat up to 115 grams of nuts a day, whereas those who do, should minimize the daily intake to 25 grams. 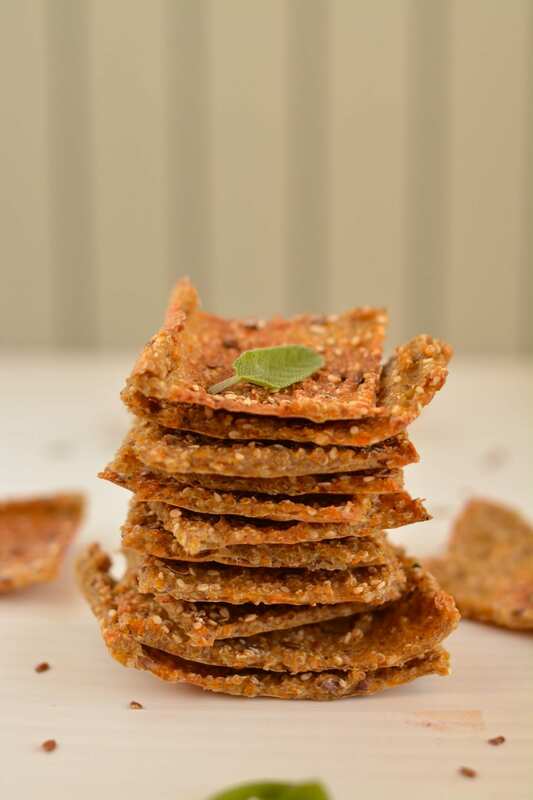 In case of my quinoa-buckwheat crackers 18% of calories come from fat, whereas my buckwheat crackers have much higher fat content – 31% of calories. That’s because they contain ⅓ cup of sunflower seeds and also olives. I try to keep my calories-from-fat percentage around below 25. Years back I thought my menu was really healthy, as I was eating mostly whole foods and avoided refined sugar. However, my meals still contained butter, oils, eggs, meat and fish. Thus, my calories-from-fat was about 35% (which of course is considered low compared to SAD). I was very surprised after analyzing my menu and at that point there was no going back. Now, if it’s that easy to go over limit with fat content using only whole food ingredients, imagine what conventional food is like! Often ½ cup of oil or butter (in addition to about 1 cup of refined sugar) is used in cakes’ and muffins’ recipes. There’s definitely something to think about, isn’t there? So, moving along with my quinoa-buckwheat crackers recipe – on Monday I was messing about with the crackers’ batter and lunch at the same time. Lunch was pumpkin-bean-cabbage curry and as I had some pumpkin left over I decided to throw it into the crackers’ batter along with other ingredients. I’m glad I did – the result was a nice yellow colour and a subtle pumpkin flavour. 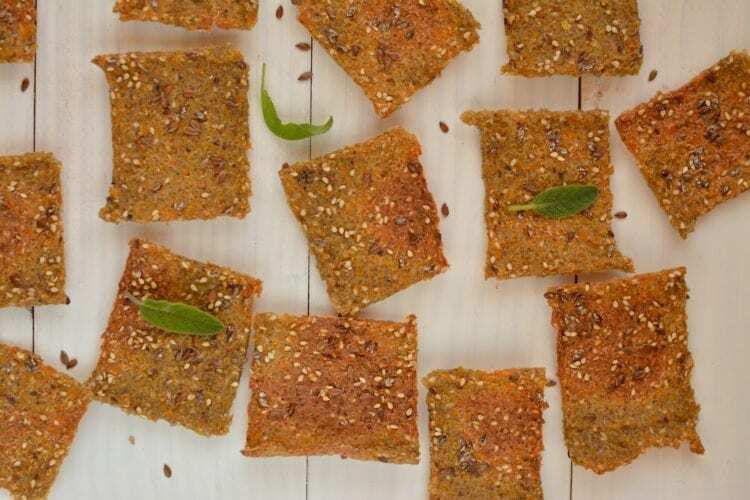 Like my buckwheat crackers with sunflower seeds, the quinoa-buckwheat crackers are also vegan and are made of whole food plant-based ingredients, i.e. 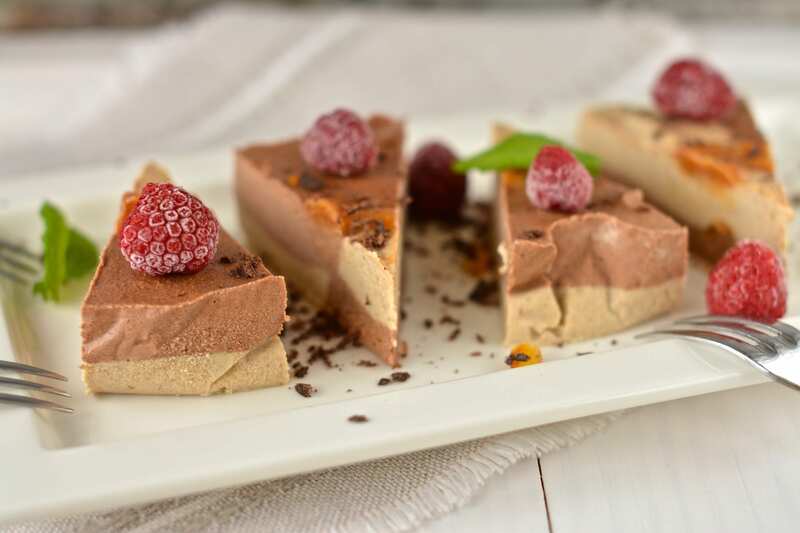 they are oil-free, sugar-free, flourless and also gluten-free. I think my next experiment with crackers will be a sweet version, and of course without refined sugar or oil. The combination of ingredients has yet to reveal itself to me. Soak buckwheat and quinoa overnight or at least for 6 hours. Rinse and drain buckwheat and quinoa and put them in the food processor together with all the other ingredients. Process the ingredients until homogenous batter forms. You’ll need to scrape the sides with a spoon now and again. Line a baking sheet with parchment paper. Pour the batter on baking sheet and spread it out as evenly as you can with a tablespoon or a spatula. Sprinkle some sesame seeds and flax seeds on top and press them in using a spoon. Bake for 30-35 minutes, and then turn off the heat, open the oven door a bit and let cool in the oven to get it really crispy. 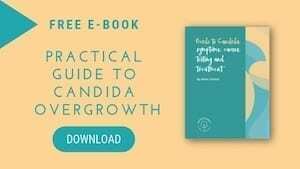 Should you like it a bit soft, remove immediately and start munching. No, you need to take raw quinoa and buckwheat and soak it in order to make the crackers! I hope you’ll like them! Hi! Not a big fan of pumpkin.. what else could I use? You can sub some of the buckwheat with quinoa! I’ve been looking for something like this. Thanks for the recipe! Would pumpkin puree work instead of fresh cubed? Look forward to trying this recipe! I think it would. Make sure it’s nicely thick puree. If not, add a bit less of liquid. I hope you’ll like it! Can you make video of this pumpkin cracker? I like your blog. Nice description, and the video is clear. Thank you! Thank you so much! I’ve actually thought about it 🙂 It’s in the pipeline!